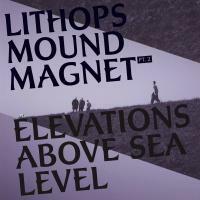 "Elevations above Sea Level" is the second Mound Magnet part from Lithops aka Jan St Werner, 1/2 of the prolific duo Mouse on Mars, 1/3 of last year's surprise collaboration "Von Südenfed" with the Fall's Mark E Smith and 1/2 of the dsp group Microstoria. Though he is a prolific producer he seems to have a fascination with rollover dates (he cancelled mostly every Lithops gig in the last 5 years) does that spill into a fascination with cycles of nature? No! Actually he's more interested in the cycling by man-made machines, as expressed in the Mound Magent sequel. "Elevations above Sea Level" gives us aural diagrams of a large, hypermodern cities with futuristic vehicles moving around. The electrical ticking of fluorescent advertising panels, a thwappy airiness of the ventilation system, the rattles of trains and chopped up hums of distant roads, the mechanical groans that maintenance machinery starts up with, rain drumming on the stretched glass roofs of urban malls, the howling groans of motorcycles on city highways. It's not an ambient record by any means, nor is it purely musique concrete. It's rather an acid fulled hallucination of how to detect an idea of the future in the noises that surround us. Though he uses some of the sound editing methods like his contemporaries (and his own other groups), this doesn't mass into huge pools to make a statement; the basslines, hums, jolts and whooshes divide and multiply into sections like buildings and streets are divided, from sub-basements to rooftops, alleys and boulevards, by stories. Lithops' narcoleptic programming has a precision which holds the listener completely captive -- difficult, haunting and highly enjoyable. The limited vinyl version is available on Sonig.